The Internet is one giant soup pot of information, where everything is all just swirled together. This can make it extremely difficult to pick out the valuable news from the inane chatter or sales pitches. As a small business owner, you don’t have time to sift through tons of websites, Twitter feeds, Facebook groups, and blogs to find out what you need to know. In many cases, you might just find one website that (kind of) answers your question and call that good. Sometimes this works and sometimes it backfires. We didn’t think that was the best way to treat hard-working small business owners, so we came up with an answer: an easier method of finding the answer you need. We’ve sorted through the mess and rounded up the best of the best. We’ve found the most down-to-earth and noteworthy sites for small business news that the online world has to offer. So if you’re searching for answers, let us help. Our handpicked, exclusive list of small business news sources can help shine the light on the latest developments and trends in capital expenses, loans, budgeting, forecasting, marketing, social media, taxes, HR issues, government standards, advocacy, licensing, and networking, among many other subjects. And we have not only culled websites—we also found business leaders on Twitter, news feeds, and blogs. Sometimes you just want your news delivered from a friend (or a small business champion). The people listed below are a few of the best to follow if you want to stay current on small business news, ideas, and trends. Barbara Weltman has been an advocate, public speaker, and resource for small business news since the release of her first book, K. Lasser’s Tax Deductions for Small Business, in 1995. Since then she has run her website, her Big Ideas for Small Business newsletter, and her blog, not to mention written over a dozen books. Ms. Weltman is on this list twice because for many business owners, it is easier to scroll through her Twitter feed for trending topics and news events than search her website. However, if you don’t take a minute to read her newsletters or blog—you’re missing out. Known as the SmallBizLady, Melinda Emerson created #SmallBizChat, the longest running small business live chat on Twitter. Small business owners tweet their questions or thoughts on current events from all over the world with #SmallBizChat. She’s also a regular columnist for The New York Times and also writes for The Wall Street Journal and MSNBC. Like Barbara Weltman, she shows up on this list twice because not only does she run a boss Twitter account, but also her website and blog are top notch. Co-founder of Hubspot, Dharmesh Shah also founded the blog, OnStartups.com, which has over 350,000 members in its community. He has invested in over 40 startups and has co-written both Inbound Marketing: Get Found Using Google, Social Media, and Blogs, and Inbound Marketing: Attract, Engage, and Delight Customers Online. Visit the OnStartups.com blog for small business news, features resources, readings lists, and a question and answer forum. Known for her fresh insight into sales strategies, Jill Konrath is also the author of AGILE Selling and SNAP Selling. She regularly writes thought-provoking tweets on current events and shares articles from numerous sources. Her blog is a great place to get started to learn the ins and outs of sales. Columnist and small business owner, Gene Marks, writes regularly on his blog and for the Washington Post, Forbes, Inc Magazine, and Entrepreneur. His Twitter feed regularly shares his articles, business tips, and news; he’s also the author of Streetwise Small Business Book of Lists and The Manufacturer’s Book of Lists. Founder of Mopwater Social PR firm in Washington DC, Amanda Miller LittleJohn is nationally recognized as a PR expert. Follow her on Twitter or check out her blog for the latest developments in the PR and social media world. Plus: regular podcasts and events to learn more from the master herself. The Women On Business news site was established in 2007, and since then (with the addition of their Twitter account) has been delivering useful information that women need to be successful in the business world. Their tweets are all about sharing thought-provoking articles and ideas, like how to say no and delegating work. Want to read more? Visit the blog. So many news sources, so little time. 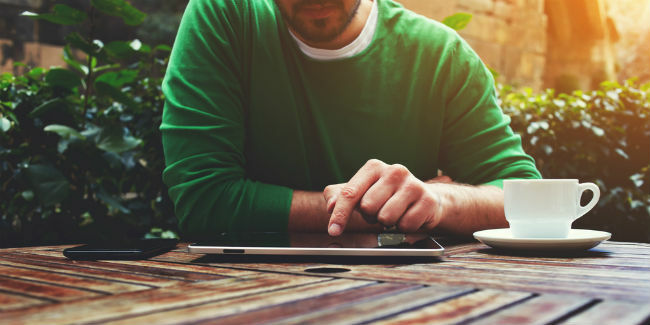 We’ve narrowed the field for informative sites that relate to small business news, including teachable articles, finance, marketing, HR, SBA loans, technology, and sales tax. Never fear: we included some fun ones, too. Have you ever wanted to start a side business, but couldn’t find good information on how to do it? Or what was trending? Nick Loper’s Side Hustle Nation is all about helping you find your side business and growing it to its full potential. Chock full of news and guides, Side Hustle can increase your income from a little to a lot. Linked to Small Business Briefs, the Twitter feed Small Biz Answers updates daily with the latest and greatest articles in small business news. The leaders of the site focus on articles “that provide actionable information for small business owners and their employees. In other words, articles that can teach you how to do things.” They also run the Small Business Ideas Forum, where anyone can ask questions and encourage their fellow business owners. Business 2 Community focuses on small business news and current trends. They maintain a team of over 10,000 contributors who write on a wide variety of topics including world news, marketing, finance, arts & entertainment, and technology. Their main page is divided into three categories: News Articles, Trending Now, and Popular Today, so business owners know they are finding the most current information. Regularly read by Mark Zuckerberg, among many others, VentureBeat is a great spot for news and trends on technology innovation. They offer several avenues to narrow your focus, but the entrepreneur and small biz might be your best bet. Started by one of our all-time favorite small business experts, Rieva Lesonsky (@Rieva), SmallBizDaily covers every small business topic imaginable, with the amazing clarity and authority Lesonsky is known for. They produce a weekly roundup of small business news that is an absolute must-read! Small Business Trends offers articles on a wide variety of subjects including retail trends, management, taxes, and technology. They also have a humor section with funny cartoons for when you need to de-stress for a minute. Plus, they have guides, tools, and templates to help out the small business owner. Don’t forget: you can also download their digital magazine! The Small Business Administration has been around since 1953, so it’s surprising how many small businesses don’t take advantage of the resources they provide. Outside of small business loans and grants, they also information regarding writing a business plan, obtaining proper licenses, taxes, human resource issues, and small business news. The SBA isn’t just for newly started businesses; veteran owners will find useful information as well. The NFIB trade group boasts over 325,000 members and regularly lobbies state and federal governments on their behalf. Their website offers news and resources on a variety of subjects like finance, HR, and marketing, plus videos. Want to know which presidential candidate supports small business? NFIB has the answer. The State Small Business Credit Initiative (SBCCI) is part of the Small Business Jobs Act of 2010, signed into law by President Obama. Funded with over 1.5 billion dollars, the Initiative’s goal is to spur small businesses and manufacturers. That support has led increased financing available to businesses, like the Downtown Development Revolving Loan Fund (DDRLF). The DDRLF provides below-market financing (2% or 3%) in core historic downtown areas to spur commercial development. This is just one of many different types of programs available, check out this list of states and funding amounts to learn more. New programs and ideas are developed all the time in every part of US so check back often to stay up-to-date. The goal at Nerd Wallet is to “help consumers take back control of their choices in a marketing-driven, trillion-dollar industry.” To that end, they offer informative articles and free online tools to find everything from the right credit card to the right insurance for small business owners. If you want to learn which retail POS system is right for you or the best place to start a business in Washington, Nerd Wallet will help. Sales tax compliance can be a nightmare for online retailers. Fortunately, we have TaxJar. They run the best blog out there on sales tax news, sales tax due dates, and other issues. Do you know how to file a South Carolina sales tax return or when the Michigan sales tax licenses are expiring? TaxJar does, and they want to share with you. This ain’t just small business… This is small town business. Becky McCray, cattle rancher and liquor store owner, founded Small Biz Survival because she believes that “when local entrepreneurs prosper, they help their small town prosper, too.” The site has numerous practical articles for the business owner, as well as a weekly Brag Basket where you can submit your success story, congratulate a friend, or write a love story to your small town. Becky McCray also writes her own blog, Out Standing In My Field, if you want more. An online community and blog based out of Allentown, Pennsylvania, Small Business Bonfire gives readers the chance to learn more marketing, finance, productivity, and managing employees. Plus articles on your home office and startups. Sign up for their weekly newsletter and you receive their small business marketing template too. Whatever your question might be about eCommerce, Practical eCommerce will have your answer. They cover a wide variety of topics, like carts, platforms, design and development, management, conversion, and marketing. Plus: handy how-tos, webinars, and newsletters. If you want to grow your online retail business, this is the place to stay current with small business news and trends. Like Practical eCommerce, the Shopify blog offers in-depth news and answers to any and every eCommerce question. They offer help with starting a business online and selling online, as well starting and growing a brick and mortar storefront. Plus all the latest in eCommerce trends. For example, did you know that mobile now accounts for 50.3% of all eCommerce traffic? The Shopify blog wants to put data like that in your hands. You may think you know content marketing, but visiting the Copyblogger blog could get you nervous about that idea. Copyblogger wants to go beyond SEO and social media to get you to be the best content marketer for your business. To that end, they offer an outstanding blog, plus webinars, eBooks, and seminars. Whether your question is on your landing page or your infographics, CopyBlogger will help. We know The New York Times is pretty standard reading material for a large majority of people, but perhaps you might not be aware of their online sections on Entrepreneurship (formerly known as Small Business) and Your Taxes. Readers will find the most up-to-the-minute information on subjects like small business taxes, healthcare reforms, and credit scores, not to mention inspirational stories of entrepreneurs from around the world. Shout out to all the HR managers and executives out there who work hard to ensure employee satisfaction and company compliance. It’s a hard job, but someone has to do it. No one knows that better than HRMorning. They regularly present articles on new rules and regulations, offering a “Plain English” version of legal jargon. HRMorning also answers tricky questions on healthcare, employee turnover, and discrimination issues. Want to know about the current reigning champs of the social media world? Or the next big trend in online marketing? NewsWhip will tell you. Known for their content discovery platform, Spike, NewsWhip tracks what the world is engaging with through tweets, posts and likes. They also run a blog with a steady stream of the newest developments in content marketing. Part of the National Trust for Historic Preservation and focused on the historic preservation and economic development, the National Main Street Center wants to see the revival of every historic commercial district. Many historic downtowns already have a Main Street Program, which means that they are already taking advantage of the numerous resources available through the Center. However, if your city has not yet started a program, there is still plenty of information, tools, and small business news to be had through the Main Street Now (formerly Main Street News) quarterly publication. Go online to read more about how to transform empty storefronts into a booming commercial district. The National Retail Federation is an advocacy group representing retailers in the US and over 45 countries. They offer news and trends, webinars, and playbooks, plus everything retailers need to get ready for every season. By signing up to be an NRF member, business owners can gain access to their original data research on topics like holiday trends and the current economic impact on spending. Another trade organization, the National Restaurant Association, offers a “Manage My Restaurant” section on their website. It includes the latest in help with front-of-house and back-of-house operations, food and beverage trends, and advice on training and retaining staff. The Association is also an advocacy group and supports over 500,000 restaurants worldwide. The world’s largest business organization, the US Chamber of Commerce represents over 3 million businesses. Their advocacy programs target 10 challenges, including healthcare, a competitive workforce, and a reliable and secure infrastructure. Their Above the Fold page regularly posts articles on US and world news that will affect the small business owner. Social Media Examiner is the largest online social media magazine in the world. Readers will find new articles every day on online networking sites, podcasts, and blogs to drive sales and expand their customer base. In addition to daily email updates, Social Media Examiner also does a regular podcast and show series. Featured on Forbes, Inc. and Entrepreneur, Social Triggers is out to make you into a master marketer and salesmen. Derek Halpern built this free small business news resource for owners who want to take their Internet marketing to the next level. The website offers a blog, a free e-book, and free training. It also links you to Social Triggers YouTube channel to view all of their webinars. DIY Marketers is all about cutting the stuff and nonsense from online marketing. The useful blog features posts on topics like lead generation, low cost marketing, marketing trends, and social media. They also offer webinars, events, and even a book app. Co-founded by Dharmesh Shah, one of our personalities to follow, HubSpot’s many blogs (Marketing, Sales, Agency, Academy) all frequently feature instructive articles for small business owners. Hubspot also has German and Spanish Inbound Marketing Blogs. Duct Tape Marketing, founded by John Jantcsh, author of Duct Tape Selling, The Commitment Engine, and The Referral Engine, features a blog, as well as e-books, podcasts, and webinars for members. Find information on Facebook dark posts, as well as the five questions you should be asking your customers among many other topics. Fit Small Business offers free in-depth reviews on the newest software, services, and financing options for small business. Some of their most popular reviews for software include the best CRM software, the best VOIP software, and the best accounting service provider. Under “Services,” a small business owner can check out the best merchant service provider or the best small business credit cards among many others. They also have a well-written and informative blog. And that completes our handpicked list of the 37 best news resources for small business news. We know that your business is one of the last things on your mind when you fall asleep and one of the first things you think about when you wake up. It was our mission to create a news site list of value. That way, when you do get a few free moments to read during lunch, you aren’t wasting your time. Or when you’re crunched for time and need an answer pronto, you go to a source known for its accuracy and accessibility. Fundera knows that running a business is a 24/7 job. It’s our mission to save your time and money, and we hope you find this list informative and useful. If you think we missed an important news resource or think one of ours isn’t worth including, talk to us in the comments—we’d love to hear from you!